The High Peaks Alliance is a volunteer, non-profit organization made up of local hunters, hikers, birders, loggers, fishermen, snowmobile and ATV riders, Maine Guides, x-country skiers, mountain bikers, and others working together since 2007 to ensure continuing public access to Maine’s High Peaks Region for residents as well as visitors. The Alliance recognizes that the region, home to 10 of Maine’s 14 mountains over 4,000 feet, thousands of acres of working forests, hundreds of miles of motorized and non-motorized backcountry trails, and rich wildlife habitat, is too special and too important to let it be gradually posted, subdivided, gated and eventually lost for its forest production and traditional backcountry recreation uses. We welcome those who would set aside differences to work together to ensure public access for present and future generations in the High Peaks region. Please take our short conservation survey and let us know what kind of land conservation you would like to see in the High Peaks Region! Consider joining us for a meal at our annual Moose Spaghetti Supper and World Famous Pie Auction, held every spring in Strong. 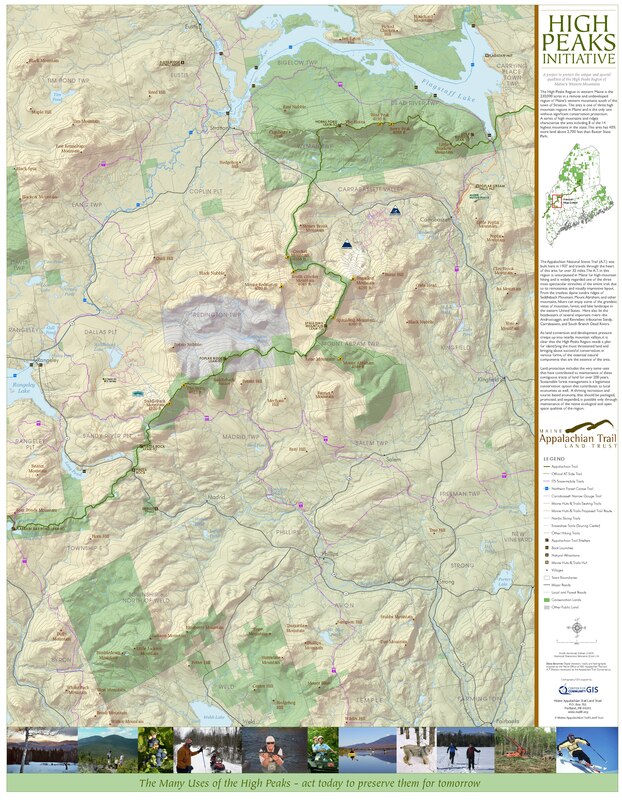 High Peaks Initiative poster map. Great concept. How do I get involved? Thanks for your interest! If you would like to get involved please contact us by e-mail. We have lots of opportunities to help out with everything from conservation projects to trail work. Dedicated volunteers make the High Peaks Alliance possible. anything to help with this winter? Would love to be involved. Hi Susie, thanks for your comment! I would love to chat with you about volunteer opportunities some time at your convenience. Please send us an e-mail at highpeaksallianceinfo@gmail.com. Thanks for your interest! Hello I came across an old postcard addressed to Cornelia T Crosby ” fly rod”. It was written in 1904 by A.P. Kazard of Bradentown Florida. The post card is in good shape and readable. Would this be something of interest to the state of Maine?? I’m sure that the Outdoor Sporting Heritage Museum in Oquossoc, Maine would be very interested. This is part of the Rangeley Historical Society. They have other material from Fly Rod Crosby. If you google them you will get more info. The Executive Director is Bill Pierce. Written in 1904 by A.P. Kazard an apparent friend. The card is in good shape. Wondered if this is of interest?